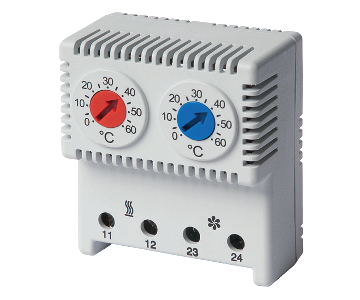 Compact Thermostat for DIN 35 mm. rail mounting. Based on bimetallic junction, provides high capacity NO or NC contact. 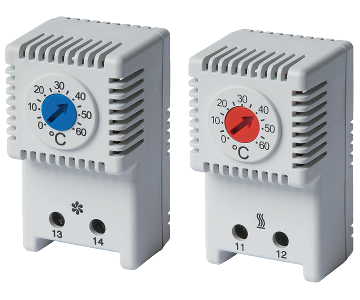 Compact double thermostat for DIN 35 mm. rail mounting. Based on bimetallic junction, provide high capacity and separated NO and NC contacts in different combinations. 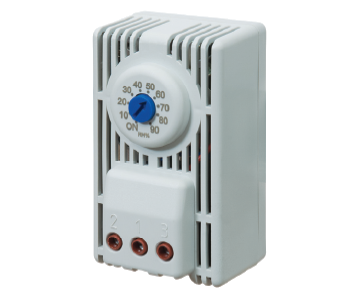 Fixed set point compact thermostat for DIN 35 mm. rail mounting. Electronic Hygrostat for DIN 35 mm. rail mounting. 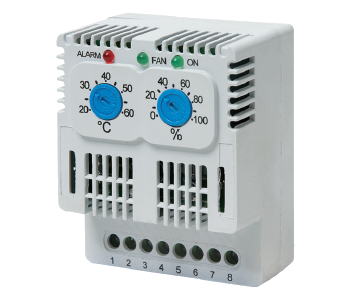 Typically used to control enclosure heaters. LED display of power on and status. 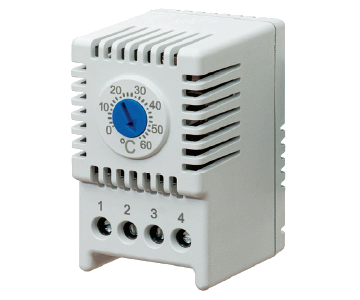 Electronic Hygrothermostat for DIN 35 mm. rail mounting. 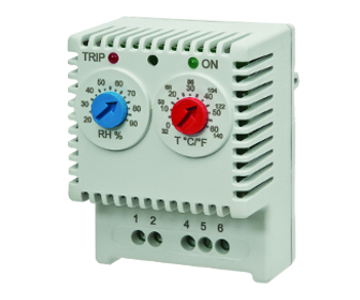 Typically used to control enclosure heaters. Hygrostat for DIN 35 mm. rail mounting. 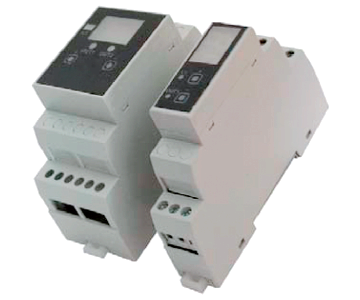 Compact Size – 1 DIN Module (17,5mm) or 2 DIN modules (35mm). Digital adjustment of tempearture (2 red digit). 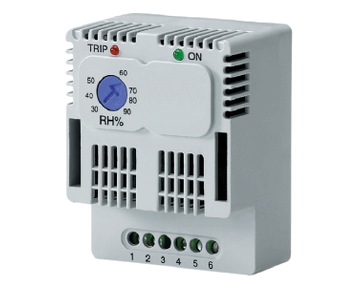 Electronic temperature-regulated fan speed controller for DIN 35 mm. rail mounting. 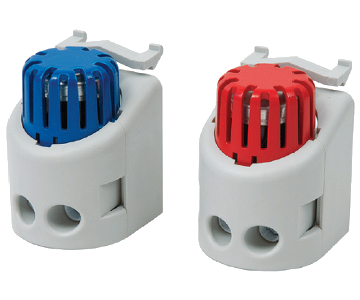 Speed controller helps to reduce fan noise, air flow rate is reduced to the optimum speed required. 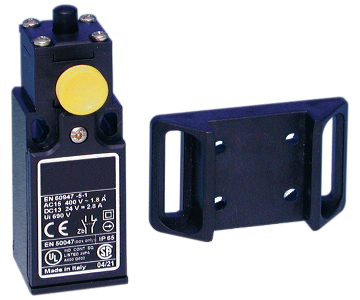 The fl ashing safety devices series FS prevents accidents, alerting the operator that the electrical system is live. 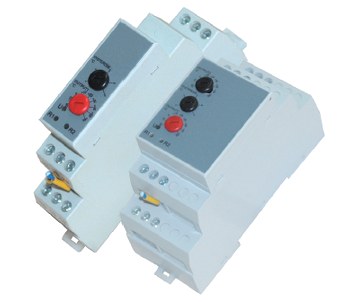 The FS devices are suitable for connection to three or single-phase lines. 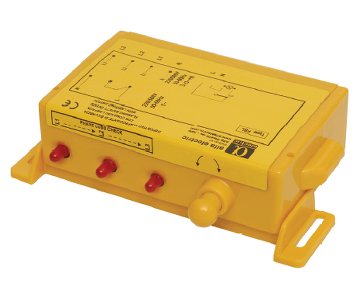 Required on most enclosures for safety and operation of auxiliary circuits, such as switching on lamps or switching off ventilation/air conditioning when the door is open.